What are the characteristics of a good book? It should keep you hooked and should have an element of mystery to be revealed at the end. The first quality is ensured because Michel Danino has made a good effort in putting a lot of information about the mighty river and Indus Valley civilization (IVC). In addition, the fluidity in his writing style makes it an easy read. Since this topic has great consequences for the debate on Aryan Invasion/Migration Theory, Danino has reserved that discussion for the end which keeps the mystery element alive till the last chapter of the book. Given the vastness of the Aryan Invasion debate, we will not keep this article as a simple book review but add our analysis about how Saraswati river forms an essential part in this jigsaw puzzle. One of the biggest misconceptions that this book clears up is that the association of Ghaggar-Hakra system with ancient Saraswati is not a recent discovery which is based on the new evidences from satellite imagery. What the recent satellite pictures do is further corroborate the presence of paleo-channel of Saraswati as predicted by other fields like geology, linguistics and archaeology much before these satellite images became available. Danino builds a compelling story by adding pieces of small discoveries about Saraswati that started in the early 19th century after the first surveys of Rajasthan and Punjab were conducted by the British Raj. The first section of the book deals with the work of past two centuries that has gone into the understanding of this river as we know it today. The readers are taken on this exceptional journey which begins by following the first explorations done by Colonel James Tod, who was deputed in Rajputana in 1812. The narration follows by recounting stories of some amateurs and other professional surveyors, who bumped into the mighty Saraswati in one or the other way, sometimes based on rural folk traditions or other times through hard archaeological and geological discovery. This understanding about Saraswati becomes perfectly clear after the advent of modern satellite imagery and Danino does a perfect job in summarizing the findings from these recent studies. The story about lost Saraswati becomes more interesting after the discovery of IVC settlements along the now dried up Ghaggar channel in the dry and arid regions of Thar desert, thus establishing the relationship between the IVC and the mighty river of the Vedas. This relationship is explored in further detail in the second part of the book, which takes a deep look at the IVC settlements along Ghaggar. 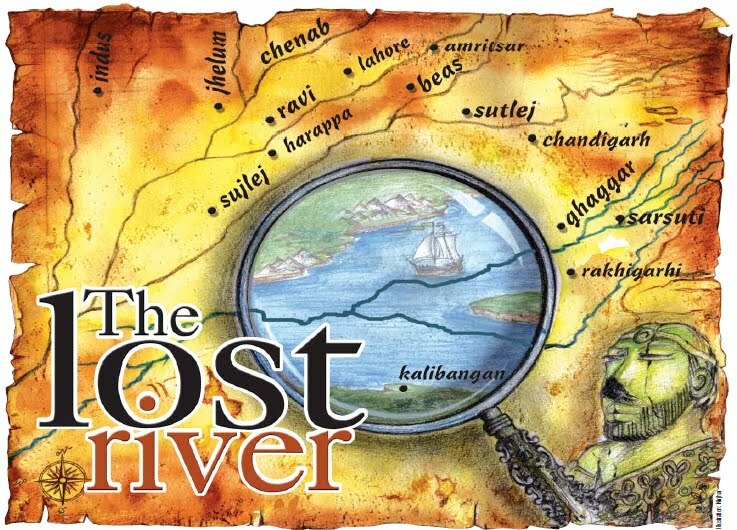 Surprisingly the number of settlements along the lost river is much higher than those along the banks of Indus river. Danino thus makes a good case for renaming IVC as Indus-Saraswati Civilization as the current name reflects the partial knowledge that we had at the beginning of 20th century. This is definitely a suggestion which will not go down easily among the current generation of leftist historians in academia. The third section of the book is definitely the most interesting part for the readers who have closely followed the debate on Aryan Invasion Theory. Here again, Danino makes convincing arguments to connect the old IVC with the latter Vedic civilization. The evidences for this connection range from the materialistic matters like weight measurements and arts to spiritual traditions like yoga. No surprise, the proponents of Aryan Invasion theory have wilfully disregarded all this evidence and are happy to concede that there was a big 800-1000 years of gap, often called dark age, between last IVC period and the early Vedic civilization. Where does this book leave us then? Following Occam’s razor, one has to go for the simplest explanation that the might Saraswati once flowed through India and hence captured the imagination of all the Vedic poets. Why else would they recount the location of the river such as in NadiStuti verse or later talk about its slow disappearance as in repeated references in latter Vedas, Mahabharat and other Vedic texts? On the other hand, one really needs to do a lot of mental gymnastics to claim that the mythic Saraswati river is the Helmand river in current Afghanistan. Once it is accepted beyond doubt that the current Ghaggar system was the mythical Saraswati as mentioned in the Vedas, it will have a great impact on the study of Indology. Not only it will completely discredit the whole Aryan Invasion/Migration theory, it will also require fresh research to put correct dates on the Vedic texts as well as the IVC. A new survey into geology will help put a precise date on disappearance of Saraswati which in turn will help come up with correct dates for Vedas and other Hindu texts. The disappearance of a big river like Saraswati, which sustained the whole IVC, forms a credible case for slow deterioration and disappearance of the mighty IVC. This negates the need for any invasion or migration to be the primary reason for disappearance of IVC. Also, this implies continuity of the Indic civilization, as its centre slowly moved from the banks of Saraswati to the banks of now revered Ganga. The only missing part in this whole story is the Indus script, which is not yet deciphered, but will complete our understanding of this great puzzle!